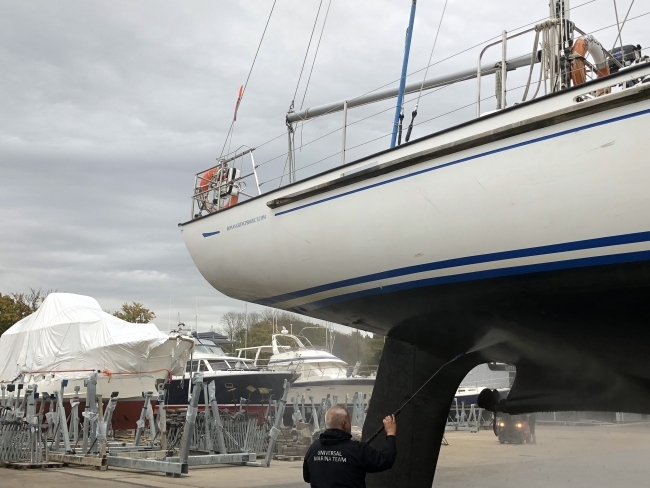 Airia Compressed Air Solutions, an official premier distributor for Atlas Copco Compressors, has contributed equipment and its expertise – on a pro bono basis – to fulfil an important paint spraying application in the Rona Sailing Project. The compressor’s load/no load control algorithm optimises performance and reliability, while minimising power consumption. It switches the compressor controller automatically to the optimum control mode for high, low or intermittent air consumption. Additionally, the Full Feature (FF) version, as used for The Rona Sailing Project,has a built-in refrigerant air dryer that prevents moisture from entering the compressed air network. This avoids rust in the compressed air piping and damage to the air tools, as well as contamination of the paint. Atlas Copco’s G11 compressor is part of the G7 – G15 EL series and is quiet, efficient, powerful and reliable. It also features a patented, powerful rotary screw element which permits a 100 per cent duty cycle, while offering a free air delivery increased by up to 3 per cent compared to previous models.